Apparently, there may be a shortage of canned pumpkin this year. I’m not too worried, because luckily there is a local farm here, Dad’s Farm, that grows pumpkins. They also have a petting zoo, a tractor ride, a hay ride, and other produce available. We took the girls a couple weeks ago, and we got pumpkins for jack-o-lanterns and for baking. We paid $20 for all of these pumpkins. The 6 smaller ones are the ones for baking. The smaller pumpkins tend to be sweeter, so that’s why they are good for baking. I believe they are around $.60/lb at this farm, so the 2 larger pumpkins were about 25 pounds combined, the 6 smaller were about 8 pounds. That works out to $4.80 for the 6 small pumpkins, which after cooking I got 7 cups of pumpkin for baking. A 15 oz can of Libby’s pumpkin is 1 3/4 cups, so I have 4 cans worth of fresh pumpkin. This works out to $1.20 for the equivalent of a can. I checked the price at Fry’s Food Stores today, and 15 oz cans of pumpkin are $2.29, or $1.99 after you use your VIP card. Preparing the pumpkins for baking is time consuming, so paying a little more for a can is probably worth the time savings, but if you can’t find canned pumpkin or like to do things like this (like I do) to get fresh ingredients, it’s worth a try to prepare your own. First thing, no matter your method, you need to wash and dry the outside of the pumpkins. Then, cut each pumpkin in half and scoop out the seeds and innards. If you want, set the seeds aside for roasting. 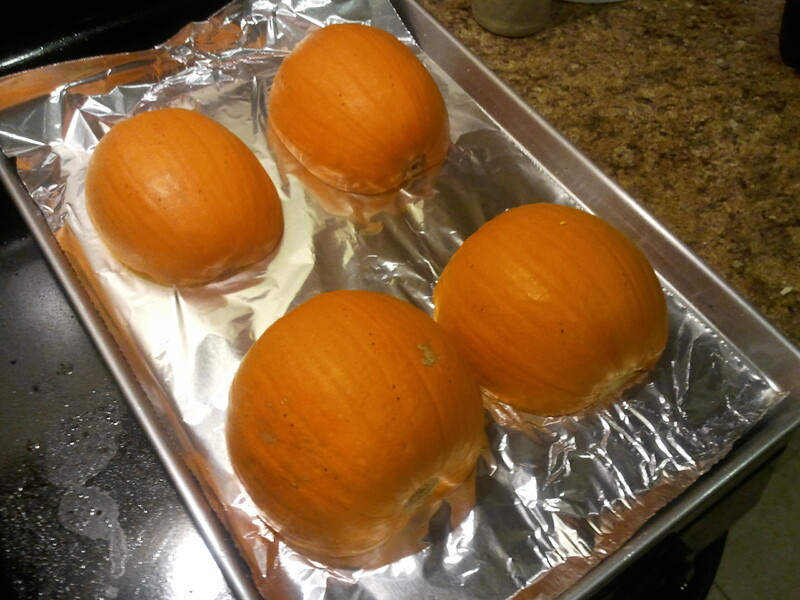 Preheat your oven to 350 F. Line a baking sheet with foil and place pumpkins cut side down. Pierce the skin with a fork. Bake for 30-35 minutes, or until skin has softened and easily pierces with a fork. Flip pumpkins over and allow to cool. Fill the bottom of the steamer to the Lo water line. 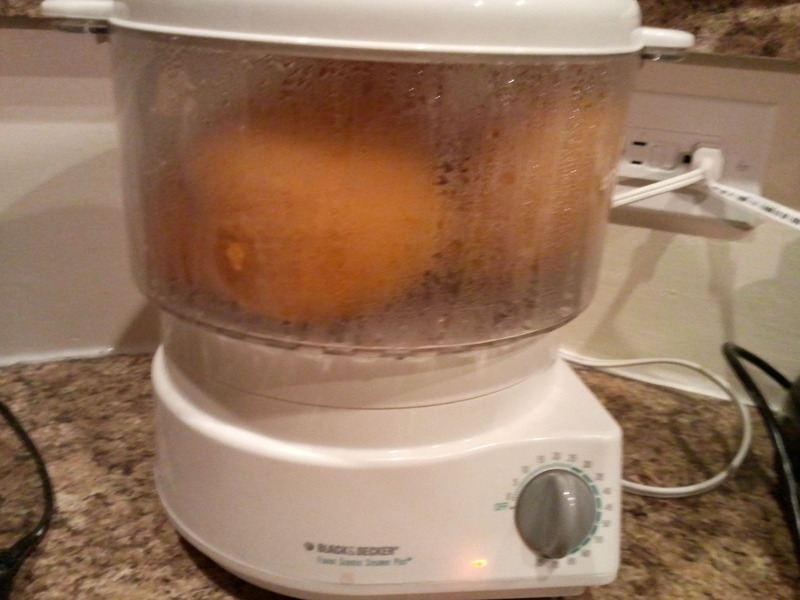 Place pumpkins in the steamer, cutting up more if necessary to get them to fit. Cook in steamer for 30 minutes, or until soft. Remove from steamer and allow to cool. 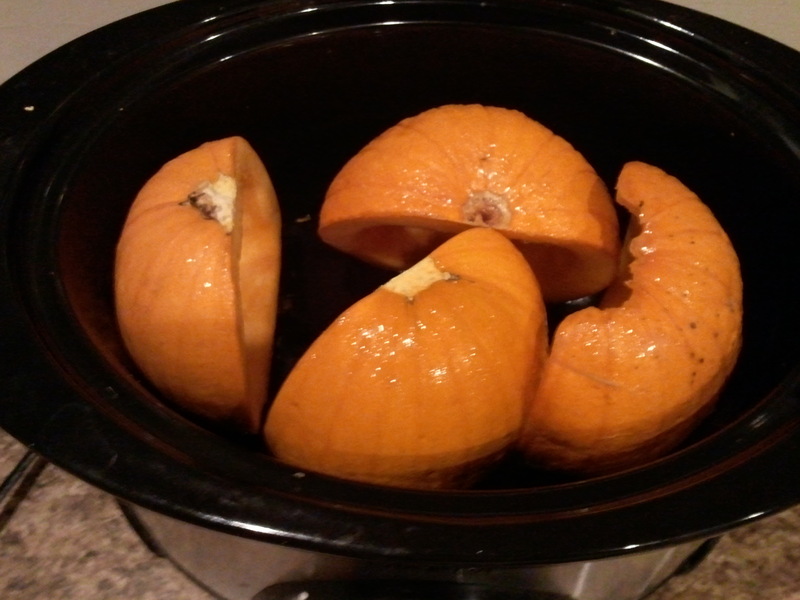 Arrange pumpkins in slow cooker, cutting up more if necessary to get them to fit. Add 1 cup of water to the bottom of the slow cooker. Cover, and cook on low for 6-8 hours, or high for 3-4 hours. Remove from slow cooker and allow to cool. 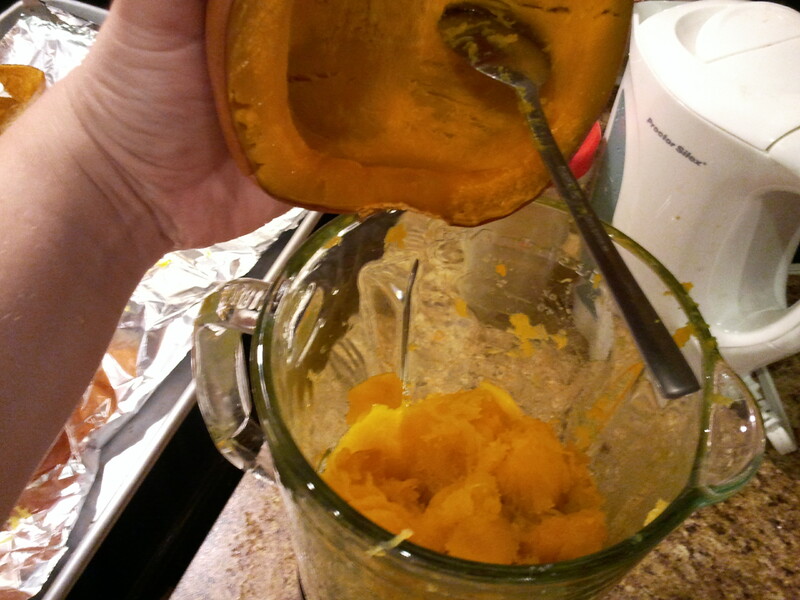 Once pumpkins have cooled, scoop the flesh from the skin using a spoon into a food processor or blender. Puree the pumpkin until smooth. If there seems to be a lot of water in the puree, line a colander with paper towels and pour the pumpkin puree onto the paper towel. Let sit to allow some of the water top drip out of the pumpkin. 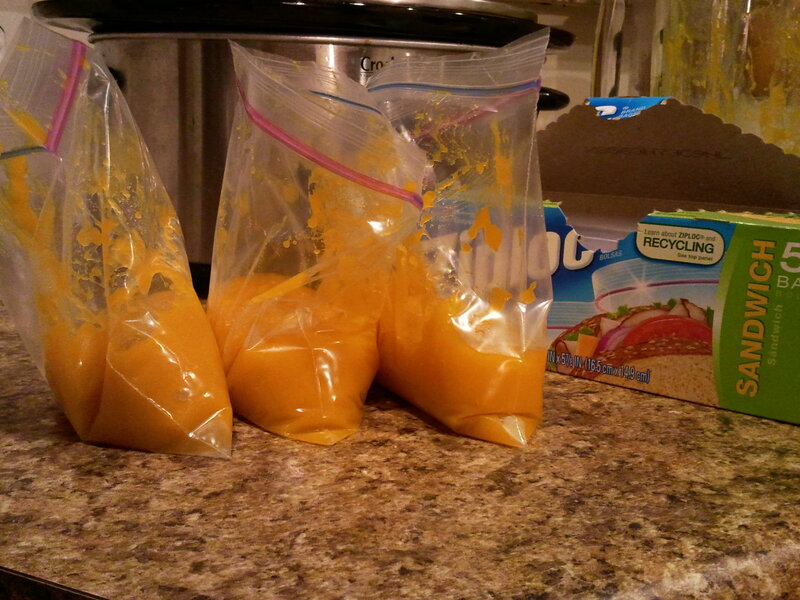 Measure out 1 3/4 cups of the puree and put into a sandwich sized zipper bag, or whatever type of container you desire for storage. Label, and store in fridge or freezer until you are ready to bake with it. Now I need to get together all my pumpkin recipes to decide what to make. I’m thinking Pumpkin Gingerbread Muffins, Pumpkin Pancakes, and Pumpkin Pie so far. Yum! I am the person who would rather buy the canned pumpkin but I think this year Britney would LOVE to see how to do it from start to finish. She was talking about how “I bet Grandma could do it” when we were talking about making a pie from a pumpkin instead of buying it canned. It’s not hard, just time consuming. You can do it, Jenn! Did you have a preference between the methods? Did one group come out better than the others? I think we’re doing it this weekend and then making a pie. But I’m going to buy the pumpkins from Safeway or Fry’s, I think instead of going back to the farm. Doing it in the oven makes the house a little warm, but since it’s cooled off here a little, it’s probably not an issue. I did find the ones in the steamer and slow cooker to be a little more watery, but not bad. The slow cooker takes the longest, but it’s also something you can start at the beginning of the day, leave it to do other things, and come back to later. All that said, I think I just prefer to do it in the oven. Well….we did it this afternoon and I baked them in the oven for 35 min. After they cooled, I put the flesh in my (tiny) food processor. That’s when things did not go according to plan. LOL I don’t know if I needed to cook them longer or what, but they just wouldn’t puree. I had to put water in it to get it to do that. So now I’m letting it sit in a papertowel lined colander, seeing if any water soaks out. We’ll see. It’s much coarser than I thought it would be. I guess I expected it to be a very smooth puree but it isn’t. What was your consitency like? We’re gonna power thru and still try to do a pie with it tomorrow. It’s almost like a really pasty applesauce or something. ?? I wonder if maybe it didn’t cook for long enough, that’s what it sounds like to me. How big was your pumpkin? Mine were only about 6 inches or less in diameter, and the puree was pretty smooth, almost runny. When you are mixing it with the other ingredients for the pie, as long as it’s not chunky, you should be ok.